Tent Jumping was a shot of high octane adrenaline activity which has now been lost due to modern tent technology. Gone are the village fête marquees with a ridge pole held by uprights and a huge swathe of canvas draped over the top. They were anchored down with ropes tied to metal stakes hammered at an angle into the ground. These grand old dames, skirts bellowing in the breeze, held a primeval ability to thrill once you found out their secret. Climbing up on the outside of the tent, leveraging the guy ropes with your legs, you scurried on all fours to the ridge pole and vaulted yourself over the top and slid down the far side. Seasoned proponents of the skill could land on both feet and run off before being caught. Sailing in Cowes Week in the early eighties presented a glorious opportunity for the ultimate Tent Jump. 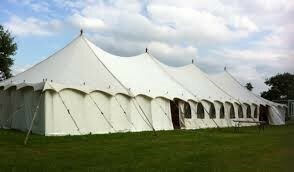 The Royal Yacht Squadron had a beauty of a marquee which stood at the top of its magnificent lawn. However, security was high as Prince Phillip was there in his capacity as Commodore. We wisely decided to give it a miss. The weather was awful, we had broken lots of expensive gear on the boat and the Skipper had rented a flat from a gay couple and was petrified about catching aids from the bed sheets. Morale was low and needed some individual acts of selflessness to bolster the troops. We resorted to drinking and were on our way back to the digs late one evening when we saw a cracking tent. It was pitched in the grounds of the Island Sailing Club, and a dinner was coming to an end within. I looked for volunteers from the crew. No takers apart from the brave John Drainger who leaped at the opportunity. We sneaked down to the marquee but were rumbled by the security guard who unceremoniously threw us out. Undeterred, we decided to attack from the other side. We climbed through two gardens and dropped down a large wall, leaving us in pole position for a swift tent jump. ‘Follow me’, I urged John, as we psyched ourselves for the task. Our crewmates looked on from behind a distant wall. ‘Scamper to the top, launch yourself behind me down the far side, land on both feet and run like hell before the security guard can collar you’. I scuttled to the ridge, slid down the far side, landed and sprinted off. As I neared our friends, I looked behind to celebrate the perfect execution of our plan with my co-jumper. He had disappeared. There was no sign of him. Suddenly there was a commotion at the marquee entrance. John was hobbling away from the security guard who was busy thumping him to help him on his way. Disaster had struck. My slide had weakened the canvas and John had split the tent from top to bottom in his efforts to follow me. He fell through the hole, landing on his head on one of the tables. The diners gaped at the youth who had fallen out of the sky and ended up in their cheese. Security was called and immediate justice dished out. A newly qualified doctor in our crew, Pete Harrington, carried out a basic check and declared that John was fit enough to run like hell before the police arrived. The next morning brought a steady drizzle and I felt a pang of guilt when I saw a man with a large needle stitching a patch on the gaping hole. I had the floating sensation that I was acting out a part in a movie, trying on the words, trying on the story. The previous May, around the time my mother was coming to see that the cancer was the thing that would kill her, I picked her up from chemo and she asked me to take her to the Cloisters before going home.